‘You cannot change the circumstances, the seasons or the wind, but you can change yourself. That is something you have charge of,’ the American philosopher and motivational speaker, Jim Rohn, once said. This insightful quote aligns with the philosophy behind the very successful Grain Academy Programme. The Grain Academy is a leadership programme steered by Syngenta with the support and endorsement of Grain SA, in partnership with the University of the Free State’s Business School. 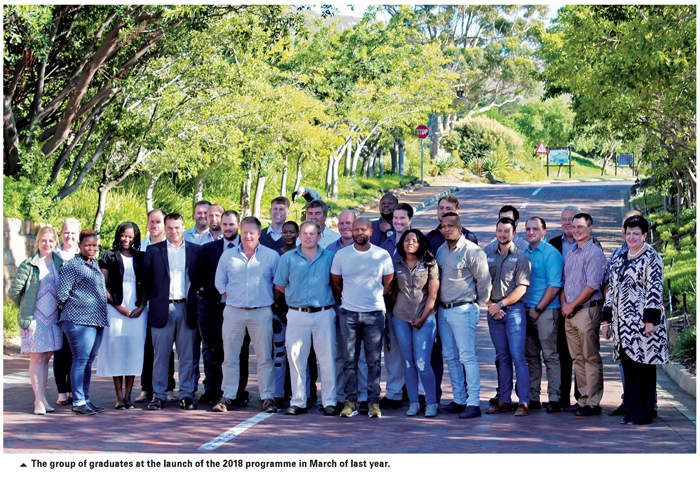 It is custom-made for young commercial producers to empower them to deal with the ever-increasing challenges the South African agricultural industry faces. The idea behind the programme is to instil a Smart Farm approach to agriculture where the future of agriculture must be shaped rather than left to chance. The aim of the academy is therefore to equip young dynamic producers with the skills to tackle the issues in the agricultural industry and to apply these new business leadership skills to their own enterprises. According to Rohn – who was regarded as a major force in the world of personal development – the major value in life is not what you receive, but what you become. For the participants this path of self-discovery at the Grain Academy was less about achievements and more about personal growth and developing life skills. For some participants this was not the first leadership course they attended. Mr Jacques Roos, the group commercial manager at the Schoeman Group in Delmas, Mpumalanga, has attended several leadership courses. The programme is based on four pillars: Courage, challenges, conversation and change. Socrates, the classical Greek philosopher, shared that the secret of change was to focus your energy not on fighting the old, but on building the new. All the participants realised that it takes courage to step out of your comfort zone and face the challenges and changes for growth to occur. ‘I met people from different backgrounds who are making exceptional moves to make great contributions to the agricultural sector,’ said Tsosane. The 2018 group of 24 young commercial participants who graduated from the sixth annual Grain Academy in July this year, were challenged to deal with tough relevant issues through debate as teams. Dr René Uys, director of Thinking Fusion, shares that these ‘messy challenges’ with which the participants were faced never have just one solution. Challenges were set to enable the graduates to mull over and then enter into debate around it. Their task was to come up with suggestions as a group which could turn the messy challenge into an acceptable option. Group one had to share their thoughts on the wide-ranging implications which policy uncertainty on land reform and the expropriation of land hold for the agricultural sector and the South African economy. The messy challenge which group two had to face was the increasing liquidity risk in farming enterprises. They debated the lack of funding for agricultural projects due to the risky nature of the agricultural sector and came to the conclusion that a lot has to be done in order to ensure that all producers are able to access financial assistance. The third group examined how technology is affecting the agricultural sector. They had to debate the relentless technology trends which stand in contrast to the producer’s future social license to operate in respect of job creation, community investment, environmental protection and sustainability. Group four had to debate the fact that South Africa’s tertiary education is not delivering the higher-education talent needed for the agricultural industry. The teams were proud of the possible solutions they found for these thought-provoking challenges. Through teamwork their communication skills were enhanced as they realised that by listening to the opinions of others problem-solving becomes easier. Relationships between people from different backgrounds were developed. A well-known life quote says: ‘Do something today that your future self will thank you for’. This is exactly what these young agriculturalists did with the help of the Syngenta Grain Academy.